Jamey Barlowe has been crippled since childhood, the result of being born on the Moon. He lives his life in a wheelchair, only truly free when he is in the water. But then Jamey's father sends him, along with five other kids, back to the Moon to escape a political coup d'etat that has occurred overnight in the United States. Moreover, one of the other five refugees is more than she appears. Their destination is the mining colony, Apollo. Jamey will have to learn a whole new way to live, one that entails walking for the first time in his life. It won't be easy and it won't be safe. But Jamey is determined to make it as a member of Lunar Search and Rescue, also known as the Rangers. This job is always risky, but could be even more dangerous if the new U.S. president makes good on her threat to launch a military invasion. Soon Jamey is front and center in a political and military struggle stretching from the Earth to the Moon. Allen M. Steele was a journalist before turning to his first love, science fiction. Since then he has published seventeen previous novels and nearly a hundred short stories. His work has received numerous awards, including three Hugos, and has been translated worldwide. A lifelong space enthusiast, he has testified before Congress in hearings regarding space exploration, flown the NASA space shuttle simulator, and serves as an advisor for the Space Frontier Foundation. Steele lives in Massachusetts with his wife and dogs. Visit him online at www.allensteele.com and www.facebook.com/Allensteelesfwriter. "Steele adeptly mixes political intrigue, combat, and character development as he ushers Jamey through an action-packed trial by fire. Like the best Heinlein juveniles, the science is realistic and the concepts drawn from modern speculation, and there's even some chaste romance. This is solid, space-faring fun." "[S]pectacular settings.... nothing beats learning what it's like to walk around the Moon and how the Earth appears from there.... [T]his is for anyone who's gazed longingly upward." "Steele combines the science fiction of Robert Heinlein with modern technical knowledge and political thriller sensibilities to create a novel that should have wide appeal." "[C]an easily rank with Heinlein's best juveniles. Indeed, it reads like one of them… if it had been updated for modern science and modern sensibilities (unlike Heinlein's young heroes, Steele's recognize the existence of females, and their potential interest)…. [A]n excellent introduction to science fiction novels for the young adult reader, and also an excellent introduction to Steele's own, extended (more adult) tales of the near-future… Highly recommended." 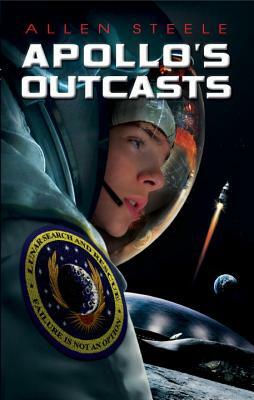 "The idea of teenagers on the moon seemed too good to be true as I've read other books about similar topics and they always disappointed, but not Apollo's Outcasts. I'd recommend it for anyone who loves space travel, political stories, or has a love for science fiction in general." "[A] book for young adults about living on the Moon that gets the science right and that includes an engrossing, well-crafted story....The Apollo lunar base is totally believable....The way it is handled in this book ties up all the loose ends of the story yet leaves open the possibility for more adventures set in this future world. I sure hope there are more because I can't wait to get back to Apollo!" "[A] charming Young Adult novel that should go down well with readers on the younger end of the YA scale as well as older science fiction fans in the mood for a nostalgic trip back to their own Golden Age of SF." "Steele writes nice sci-fi action and intrigue.... The book is really great if you're just in the mood for some not-super-hard sci-fi, something there's just not enough of in YA these days."